Rokhaya is using Smore newsletters to spread the word online. Is It A Utopia Or Is It Your Worst Nightmare??? Mao grew up as a peasant, but was wealthy enough to go to school. He studied Marxist(Communism) writings at Beijing University. Then he became a member of the CCP- The Chinese Communist Party. Later on, he became the leader of the Communist Red Army of 100,000 troops. 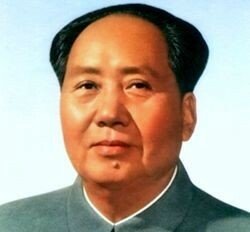 Many people refer Mao Zedong as the father of communism in China. The Nationalists Party leader Chaing Kai Sheek and 700,000 troops forced Mao Zedong and his Red Army because of there communist beliefs. They were forced out of Southern China. Zedong and his troops marched 6,000 miles west and north in order to escape. During this march, he lost 93,000 men. Over the coarse of this journey he was able to get the support from many peasant farmers along his journey. These supporters would help Zedong lead the Chinese Communist Revolution after World War II. 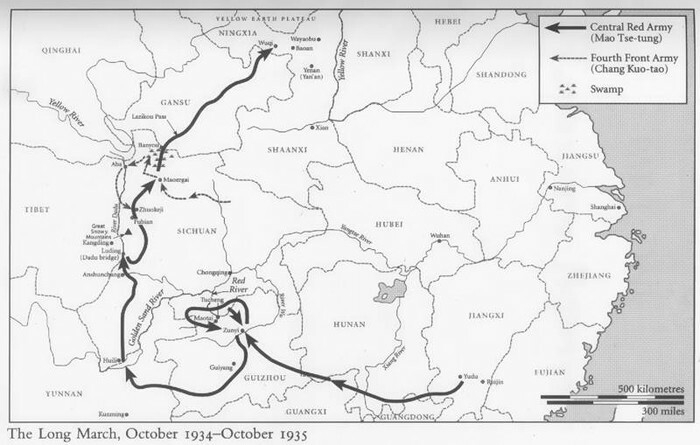 The route of the long march. 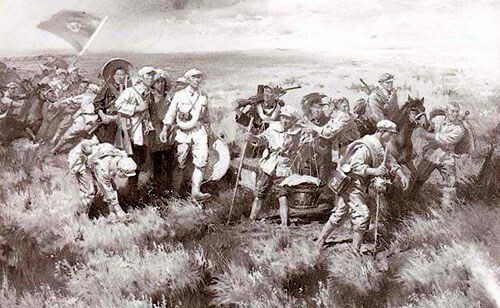 A painting of the men in the long march. Real men in long march. Mao Zedong believed that if china wanted to become powerful in the world, it needed to be more industrial( More factories and productions or goods and services). At this time, many people lived in rural areas and were peasant farmers. So Mao though that he could get his farmers to produce steel and work in factories. 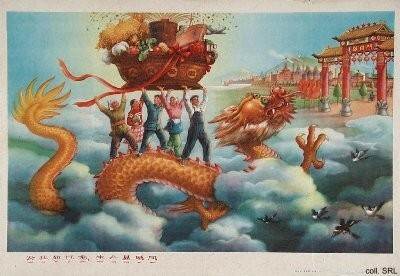 This created a shortage of farmers that were needed to feed China's large population. Combined with droughts and poor harvest millions of starvation and began to question Zedong's leadership. Mao brought change to China through Communism with powerful government to also change the culture of China. Zedong did not want Chinese people to focus on the traditions from the past, nor did he want citizens to be influenced by foreign ideas, particularly western-democracies. He only wanted people to celebrate communist government and its ideas. Religions were banned and self expression through art were also outlawed, and those who mocked the government were punished, if not killed. 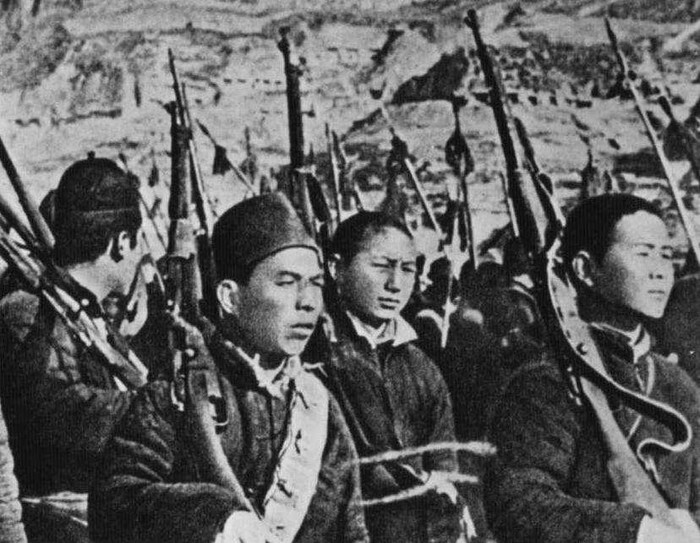 Mao recruited high school students to form the red guards who were given power to enforce the polices of the cultural revolution. Outside China, the square is best known in recent memory as the focal point of the Tiananmen Square protests of 1989, a pro-democracy movement which ended on 4 June 1989 with the declaration of martial law in Beijing by the government and the shooting of several hundred or possibly thousands of civilians by soldiers. Tiananmen Square protests of 1989, which resulted in military suppression and the deaths of hundreds, if not thousands, of civilian protestors. One of the most famous images that appears during these protests was when a man stood in front of a line of moving tanks and refused to move, which was captured on Chang'an Avenue near the square. The Vietnam war was caused because the North wanted the South to become communism too. The U.S was on southern Vietnamese side.president Eisenhower felt US presence was needed in order for south Vietnam to stay communist free.The north troops started using the Ho Chi Minh Trail. This was a path that connected north and south Vietnam using Laos and Cambodia. It allowed southern and northern troops/people to switch sides if they wanted to. The US then bombed this path, this caused Vietnamese people to not like the US, the more we bombed the more people sided with the Viet Cong. In 1976 the north and the south came together and formed the Socialist Republic of Vietnam. The US was afraid that north Vietnam would try to get other countries to become communist so we (the US) got involved to try and keep it only in North Vietnam. The Korean War started on June 25, 1950. North Korea invade South Korea in order to unit the whole country as one and be under communist rule. The united states where on South Korea's side. by October 1950 the U.N took control of Pyongyang, the capital of North Korea. But by the end of October the Chinese army forced the U.N out of North Korea. On July 27, 1953 an agreement was signed in Panmunjom along the 38th parallel , and this is where the division of Korea is. This war was for the containment of communism because the United States was afraid that communism would spread to surrounding countries. Did Containment Of Communism Work?? I think the containment of communism DID work because only 5 countries in the world are communism and 4 of those countries are in Asia. So the US only kept it in one particular place. communism didn't spread to the rest of the world so I think the United States did a pretty good job at keeping it in one place. So I do think containment of communism did work.